A couple of us met tonight for Crafternoon! I brought a shoebox of paper, string, glue and scissors and we made Christmas cards, which I’ll take to the nursing home to be passed out to those who don’t receive many visitors or mail. 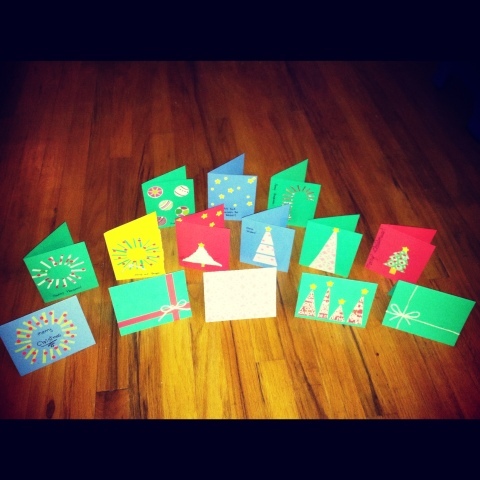 We made a nice variety of colorful cards that are sure to brighten anyone this holiday season! Since we were meeting in a coffee shop, we had many admirers and even one person said they were beautiful! 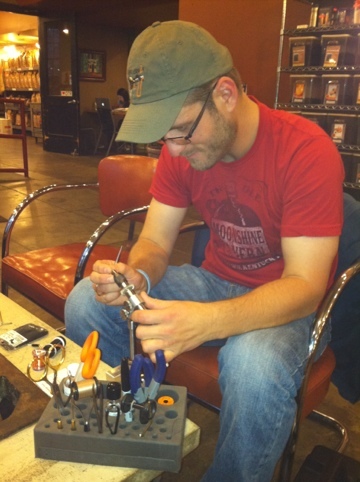 While we worked on cards, Andy, worked on tying flies. Teeny tiny pieces used in fly fishing – fascinating! See him hard at work and check out his set-up, it is all portable. Thank you Allison, Andy and Missy for coming out. We’ll have to brainstorm a project and do it again!